You all know I love to shop right? And you all know I have like zero self control as well? Does this look like a woman who has any self control? 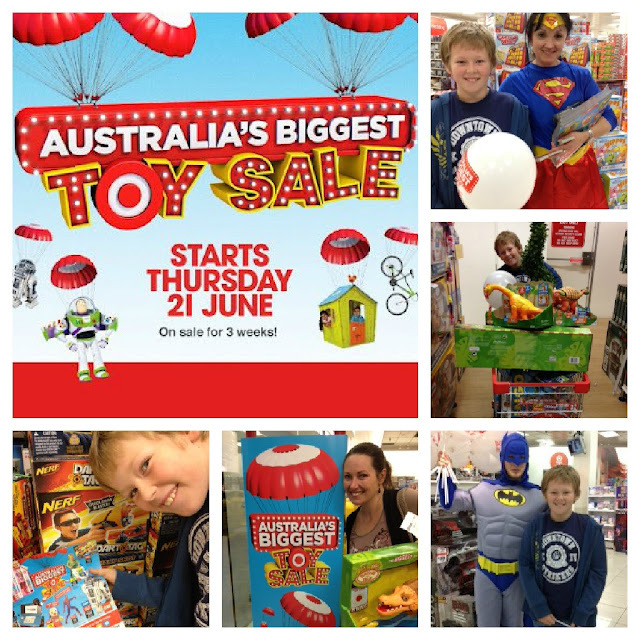 On Wednesday night a whole stack of bloggers around the country were invited to a special preview night for Australia's Biggest Toy Sale at Target.We were kindly given some vouchers to spend and we participated in a twitter scavenger hunt around the store. Fortunately the prices were so hot at this sale, self control was the least of my worries. I was more concerned with how I was going to push a trolley around AND carry anything that didn't fit in the trolley. Problem solved - I took one of my sons with me. Kai and I were like a couple of kids let loose in a toy store.... oh hang on we were a couple of kids let loose in a toy store. Righty O then. The discounts were huge, the selection was massive and yes I may have even thrown a pot plant in my trolley too. It's a big girls toy alright! The Target sale starts today and runs for 3 weeks until 11th July. Plenty of time for you to hit the shops and stock up for Christmas. Oh Lord I said the C word didn't I! But seriously why not? You can honestly save a fortune on all the top name brands that are bound to appear on your kids Christmas wish lists. OK it may have been a little bit of buttering up before I revealed to him just how much I really had stashed in the boot of the car! If you don't have a Target store near you - No Worries Beef Curries, you can Shop Online! (That's the answer to all my problems...almost) and if you want to stay up to date on all the latest news from target, you can like their Facebook Page here. The fabulous people from Target have given me a $50 gift voucher to give to one of you guys so you can go and shop your little heart out as well. Step 1. Leave me a comment - easy peasy! Make sure you contact me quickly though as the guys from Target will send you your voucher super speedy so you can take advantage of the sales if you wish. Oh pick me please!! This would help out heaps (I could buy whatever I wanted and be able to tell the husband it cost $50 less! Best idea ever. Congratulations Kel. Please send me an email to lifelovehiccups@optusnet.com.au with your contact details, so we can organise your prize for you.